The process of building Walter O’Malley’s dream stadium soon began in semi rural Chavez Ravine, in the hills just north of downtown L.A. There was some political controversy, as the residents of the ravine, mostly Hispanic and mostly poor, resisted the eminent domain removal of their homes (land which had been previously condemned for a public housing project, Elysian Park Heights) and gained some public sympathy. Still, O’Malley and the city government were determined, and construction proceeded. The resistance of the residents against their removal was known as the Battle of Chavez Ravine. Construction on Dodger Stadium was completed in time for Opening Day 1962. With its clean, simple lines and its picturesque setting amid hills and palm trees, the ballpark quickly became an icon of the Dodgers and their new California lifestyle. O’Malley was determined that there would not be a bad seat in the house, achieving this by cantilevered grandstands that have since been widely imitated. 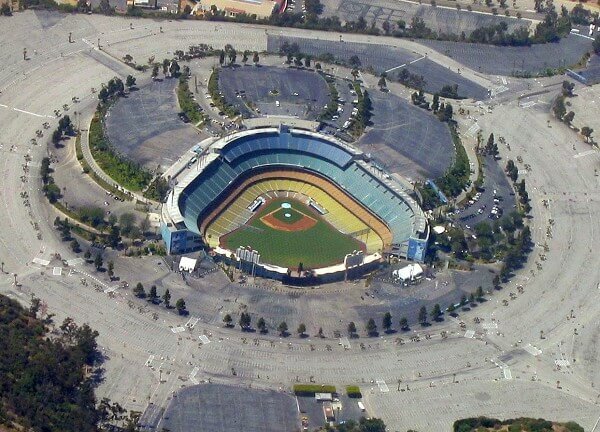 More importantly for the team, the stadium’s spacious dimensions, along with other factors, gave defense an advantage over offense and the Dodgers moved to take advantage of this by assembling a team that would excel with its pitching.